K9 Advantix II is a monthly preventative for dogs that offers comprehensive protection against ticks, fleas, mosquitoes, biting flies and chewing lice. 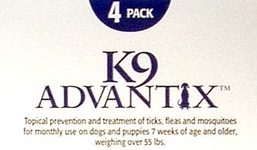 K9 Advantix II is a top veterinarian-recommended brand because it repels and kills all life stages of fleas (eggs, pupae, larvae, and adult fleas) and ticks (Deer ticks, American dog ticks, Brown dog ticks, and Lone Star ticks). K9 Advantix II kills 98-100 percent of fleas within 12 hours and continues working for one month to prevent infestations.